After spending just two weeks as an academic liaison for twenty-two people on the Autism Spectrum (and getting a sense for their inner lives), I started to observe my own behavior more closely. I’m very sensitive to sounds, colors, movement, and social cues — I love patterns, numbers, and being alone, and I have intense (often excruciating) empathy. I wondered: Am I on the Spectrum? Hmmm. Okay, so I wasn’t on the Spectrum, but I also wasn’t (as I had feared before I started the job) at the opposite end of the empathy Spectrum from my students. And yet, I could not reasonably call myself neurotypical either, since my empathy has — throughout my life — set me so far apart from average people. I continued to witness unmanageable empathy and sensitivity in my students (whom I now called my friends), tried to figure out where it fit in with the reigning theories about the alleged lack of empathy among people on the Spectrum, and went forward with my job. My husband was accepted into a Master’s program in Nursing, and we moved away from that job within a few months, but I didn’t stop thinking about my friends on the Spectrum, about neurotypical privilege and mind-blindness, and about the subject of empathy. Three years later, in 2009, I was asked to rewrite one of my books on emotions. This is a longer story, but I had worked for many years as an empathic healer, and had mistakenly framed my skills as paranormal or psychic. When I realized my mistake, I ended my career (in 2003) and returned to college to study sociology, social movements, and, well, everything. As a part of the research I did for my book (The Language of Emotions: What Your Feelings Are Trying to Tell You), I read a book by two people on the Spectrum: Dr. Temple Grandin and Sean Barron. Their book, Unwritten Rules of Social Relationships is a fascinating look at two individuals who have very different experiences on the Spectrum. Sean Barron is a male whose inner experience of autism has been extremely emotional, while Temple Grandin is a female who reports that her inner experience was and is primarily unemotional. This book is nicely balanced by Barron’s emotional perspective, and together, he and Dr. Grandin provide an excellent portrayal of what people on the Spectrum deal with emotionally and psychologically. It’s a great entrée to understanding both the Autism Spectrum and the ways that neurotypicals intuitively understand social rules even though they weren’t directly taught about most of them. As I wrote in my previous post, neurotypicals understand social rules because those rules were socially created by neurotypicals for their kind of minds … it’s not because neurotypical social functioning is objectively correct or better than any other way. As I read the book, however, I found myself arguing with Temple Grandin — not just because I had so closely observed highly empathic people on the Spectrum, but also because she was holding on very tightly to the old “emotions versus rationality” idea that isn’t supported by current neurological research. We understand now that emotions are an irreplaceable part of rationality, decision-making, thinking, memory, and especially learning. In truth, we can’t be rational without our emotions, but I understand Dr. Grandin’s struggle to overcome an emotional functioning that was totally unhelpful to her. If you asked her outright, Temple Grandin would probably agree with the idea that she is mind-blind and unempathic (this hypothesis is championed by British psychopathology researcher Simon Baron-Cohen) — but as an empath, I beg to differ. In fact, I differ strongly. In her books Animals in Translation and Animals Make Us Human, Temple Grandin describes her career in animal science. Dr. Grandin became famous for creating humane feedlots, factory farms, and slaughterhouses — and for designing and engineering many transportation and holding systems to get animals safely from one place to another. She has accomplished this by physically putting herself in the mindset of the animals she works with. Dr. Grandin describes kneeling down low and actually walking the paths the animals walk, looking at the machinery and surroundings from their perspective, and figuring out what scares or bothers them. 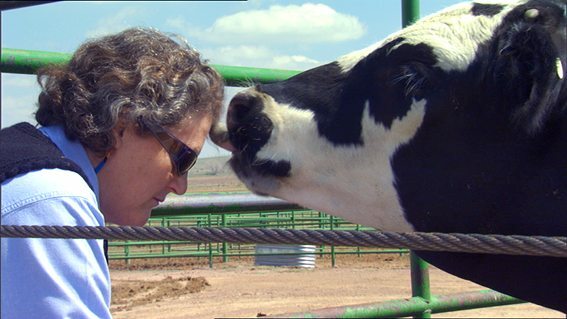 Dr. Grandin can set aside her human persona and think and feel as a cow, or a sheep, or a pig, or a chicken might — and from her vantage point, she can identify emotional triggers from these animals’ perspectives. With this information, she makes changes to the animals’ environments, and she designs feedlot equipment, stalls, loading platforms, and walkways that feel safe and make sense to the animals. Her designs help the animals remain calm and avoid panic-based injuries. Her changes and her designs insure that the animals can be loaded and unloaded from medical and transportation equipment without fear or struggle, and she makes their lives (and their deaths) infinitely more tolerable. Dr. Grandin is a heroine; she single-handedly brought humane treatment to the meat-producing industry. But get this: She did it by being able to empathize deeply with animals — not merely emotionally, but also visually, cognitively, auditorially, environmentally, socially, physically, kinetically, and relationally. Temple Grandin put herself in the place of the animals, gathered detailed information about multiple aspects of their unique, lived experience, communicated what they couldn’t, and made changes to address the troubles she unearthed. This is what skilled empaths do. Empathy is not merely the ability to understand cognitively what another person might be feeling, and it is not merely the ability to share an emotion with another person. Empathy is a socio-emotional skill that can help you enter completely into the world of another — and to translate what you sense into language and action. Temple Grandin empathizes deeply with animals; she is working as an empath. The fact that she reports having trouble deciphering human emotions does not in any way diminish her empathic skills; in fact, many of my highly empathic friends find neurotypical humans confusing. I agree. Humans are very problematic both emotionally and empathically. As a young empath growing up, I had to learn how to connect the emotions people were clearly feeling with the lies they told about those emotions, with the repressive techniques they used to quash their emotions, and with the ways that they used other emotions to mask the ones they were truly feeling. Before I learned how to identify, categorize, and create separations between myself and the wildly incoherent emotional behaviors of neurotypicals, I was on fire most of the time. Neurotypicals often let their emotions careen around like pinballs, and with some people, you can almost feel mismanaged and disowned emotions coming off of them like puffs of steam. Before I learned how to make sense of neurotypical emotional functioning, I reacted badly to the chaos. I was hyper. I withdrew. I lashed out with anger. I felt tremendous anxiety, and I used a lot of physical movement — especially with my hands — to manage my nervousness and confusion (I was stimming!). As a child, I found humans totally exhausting, and I preferred animals. Animals don’t lie! They feel their emotions and share them honestly, and they don’t pretend. I love animals! They make being sensitive and empathic very comfortable and rewarding. Humans, not so much! So Dr. Grandin might disagree strongly with me, but I see her as a fellow empath. I also see many of my friends on the Spectrum as empaths who, due to their troubles with organizing incoming stimuli — and to the reigning hypothesis that brands them as unempathic and mind-blind — have not been given the tools they need to make sense of the sideways and backward emotional functioning that neurotypicals call normal behavior. Earlier this year, my friend Edwin Rutsch, who founded the Center for Building a Culture of Empathy, hosted a question-and-answer session with Dr. Simon Baron-Cohen, the British psychopathologist who champions the hypothesis that people on the Autism Spectrum have malfunctioning mirror neurons that cause them to be unempathic and mind blind. Edwin posted these questions for me, and Dr. Baron-Cohen was kind enough to answer. Karla McLaren: Dr. Baron-Cohen, is it possible that people on the autism spectrum actually have a near-neurotypical capacity for empathy, but are often overwhelmed and unable to organize incoming emotional and social stimuli ? Simon Baron-Cohen: Yes, this is possible. We are only just beginning to understand this complex thing called ‘empathy’. In my book I suggest it has 2 components (cognitive and affective) though in the neural circuitry it looks as if at least 10 different brain regions may be involved. People on the autistic spectrum COULD have some of these brain regions working at a neurotypical level — this is something scientists could test. The idea that people on the autistic spectrum may be overwhelmed by emotional stimuli is also perfectly plausible. Thanks for putting forward a hypothesis that I hope will be testable. Simon. KM: Thank you. I had a job supporting college-aged Spectrum people, and I read everything I could get my hands on — most of which follow your hypothesis about low empathy and incomplete or missing “theory of mind.” From all these books, I thought I knew the kind of people I’d meet… but I didn’t see a lack of empathy. Rather, I saw people who were overwhelmed by incoming stimuli and who had a very hard time organizing and understanding emotional cues. I’ve since worked with many Spectrum people, and I really think the theory is leading the data-gathering. SB-C: Dear Karla, you make an excellent point that empathy is a two-way street. So-called ‘neurotypicals’ need to make an effort to understand what the world must be like for people on the autistic spectrum, and how to make people with autism spectrum conditions feel valued. Certainly, the idea of portraying or treating people on the autistic spectrum as if they were aliens is abhorrent. I also think your point that people on the autistic spectrum are “overwhelmed by incoming stimuli” is very important, since the implications is that under the right conditions, people with autism would show no empathy difficulties at all, if the incoming stimuli were not overwhelming. In fact, people are looking into these ideas. Neuroscientist Ilan Dinstein found that autistic adults had normally-behaving mirror neurons, and he is focusing further research on what he calls “noisy brain networks.” And cognitive neuroscientist Gregory Hickok has identified eight problems in the mirror neuron theory. The hypothesis that people on the Spectrum are unempathic and mind-blind is just that: a hypothesis. It was an interesting first guess, but it’s not proving to be true — and sadly, it’s actually making the lives of people on the Spectrum more difficult and more painful. their neurotypical mind-blindness about how disturbingly scattered neurotypical emotional behaviors usually are. As Brenda Rotham noted here in The Data Myth, if you’re working with a flawed or incomplete premise, your data-gathering may lead you in very unprofitable directions. This is a problem in any area of science, but it’s a problem that has serious consequences when human subjects are involved. As Simon Baron-Cohen wrote, my idea that people on the Spectrum may be unable to organize incoming emotional and social stimuli — which would completely skew any experiment that attempted to measure their empathy or their emotion recognition skills — is both plausible and testable. Until those tests and studies have been completed and reviewed, it is not only wrong and damaging to brand people on the Spectrum as unempathic and mind-blind, it is completely unempathic. The “theory of mind” testing done on 4 year old children did not take into account the children’s language processing skills. If it had, SBC would not have made such a grand error, and built such an elaborate theory to “lead the data-gathering.” You NAILED it. Thank you. Thank you! Dr. Baron-Cohen is working in a very interesting area, and I have respect for him, but on this issue, wow. The implications of human subjects research is extremely serious, and discussions like these are very necessary. Especially when, in many cases the subjects do not have a voice — or neurotypical accounts are privileged over and above the actual voices of the affected minority. This lack of response is something I’ve noticed for decades, and like many of my friends, and possibly many people on the spectrum, I have trouble digesting this unfairness. Ben, you’re so right. The stigmatization most of us unusual people feel is very painful, and it is unfair. I’m hoping that by reaching out with my empathic abilities and gathering Spectrum folks into the highly sensitive, empathic community, we can start helping neurotypicals realize just how unfair things have been. The science may be interesting, but we can look with new eyes and acknowledge that that which we don’t understand or that looks weird to us it is not wrong without figuring it out. “…The following are normal…behaviors among neurotypicals: lying about their feelings; avoiding sensitive subjects that are glaringly obvious; leaving important words unsaid; pretending to like things they don’t like; pretending they’re not feeling an emotion that they’re clearly feeling; using language to hide, obscure, and skirt crucial issues; attacking people who frighten them without ever realizing they’re full of fear; stopping all forward progress on a project without ever realizing they’re full of anger and grief; and claiming that they are being rational when huge steamy clouds of emotion are pouring out of them. Neurotypicals are often emotionally exhausting. IMHO, acute sensitivities/empathy are part of being gifted; this used to be part of survival in a raw, new world. “Gifted” kids have, over the last 40+ years, been relegated to being a nuisance, abnormal, since we do not fit into generic society as beige cogs in industrial wheels–the dumbing down of our educational industry. We “think too much”, which frightens those who cannot do that. Therefore, treat as “less-than”, put into a safer box. If that means calling us mentally ill or other derogatory labels, so be it–those create artificial buffers between “normals” and us. My score was 37 on that survey. Utterly left me “cut from the herd”. I learned to cope fairly well, and tried to live like everyone else, but arrived finally at a point of just walking away from those who keep doing that–including offensive family members–hey–50+ years is long enough!